More than 300 million people have come to the Radio City Music Hall located at Rockefeller Center to enjoy stage shows, movies, concerts and special events. There's no place like it to see a show or stage a show. Everything about it is larger than life. Radio City Music Hall is the largest indoor theatre in the world. Its marquee is a full city-block long. This theater is known as the country's leading hall for popular concerts, stage shows, special attractions and media events. Each holiday season, Rockefeller Center becomes a holiday wonderland and Radio City Music Hall features its annual Radio City Christmas Spectacular starring the Rockettes. The Radio City Music Hall is one of the top New York City venues for concerts and other events. 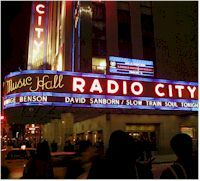 Don't miss some of the biggest names in music as they come to New York City area's Radio City Music Hall to perform live.